Virgil invited his friend Liam over to our house a couple of weekends ago. The morning after their sleep-over, they played with LEGOs and stuffed animals, watched a couple of episodes of "Ben-10," tried a couple of card games. Neither was all that interested in going outside — until Jim suggested roasting marshmallows. It wasn’t the marshmallows that got them up off the couch, although these are two boys who never turn down a chance to rot their teeth. It was the chance to build a fire. "To build a fire": Even for young readers who haven’t encountered Jack London’s timeless story of a man, a dog, and a match in a race against cold in the Alaskan wilderness, there’s magic in that phrase. Virgil and his friend Liam felt the pull. For fire, they'd agree to leave their comfortable spot indoors — but only for twenty or thirty minutes. Jim is the fire-builder in our family. He heated a log cabin and our first home using wood stoves, and he’s taught Ursula and Virgil how to lay a fire, how to light it, and how to put it out. While Liam, Virgil, and Ursula pulled on snowpants and jackets, Jim poured hot chocolate and tea into thermoses and packed them, along with a bag of marshmallows, a box of matches, and Virgil’s first-ever Swiss Army knife, in a backpack. They walked into the back woods about 100 feet, just far enough so they couldn’t see the house. Jim designated Ursula the day’s master fire-builder and Virgil and Liam her assistants. He sent the three of them off to find fire-starter material, telling them to look for downed trees or evergreens that had lost all their needles. Virgil found a dead birch tree and sliced the bark from it with his knife. Ursula showed Liam how to break small twigs and larger branches from another tree. Ursula stomped out a small space in the snow that would become a platform for the fire. Then she constructed a small lattice-work with longer sticks and lay in the bark and twigs. Jim oversaw the carving of the marshmallow sticks, which gave Liam his first-ever experience using a jack-knife. As the fire builder, Ursula had the honor of the first match. The best fires, she’s learned from her dad, are those started with a single match. She touched the small flame to the strips of birch bark and dry sticks. The boys bent down low, too, so they saw the bark begin to curl and the tip of a stick redden and then brighten as the fire took hold. A supervised winter fire is a safe way to introduce children to this elemental art. After feeding their store of sticks to the flame, Virgil, Liam, and Ursula let it burn down to hot coals, flamed a few marshmallows for good measure, and finally — reluctantly — piled snow over the remaining embers. Jim glanced at his watch. They’d been out well over an hour. Still the boys lingered, not ready to break the spell. Before they left, Liam turned to Virgil and asked, "When can we do this again?" The title of this blog comes from Norman Maclean’s book of the same name about the Mann Gulch forest fire of 1945. Instructions on how to build a fire in the snow, from eHow. 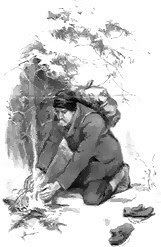 Illustration from "To Build a Fire."